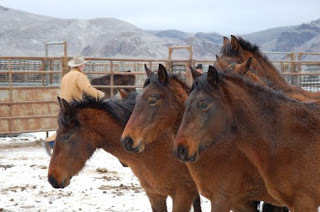 With the death of a 15-year-old stallion on February 10th, the unofficial death toll from the Calico Mountain Complex gather now stands at 45 (the BLM says 40), and the pattern of one or more daily mortalities does not appear to be slowing. Such was the nature of the grueling roundup that it is still causing extreme physical suffering and metabolic shutdown, even weeks after some of these horses were captured. Based on BLM reports, there is reason to fear that more horses will die in the days to come. The agency reported today that it "is watching three or four of the Granite horses with poor body conditions." For the last several days, there have been no public reports from the Indian Lakes Road facility near Fallon, Nevada, where the Calico horses are currently corralled, and it looks like there may be no witnesses to the actual processing of the horses, a time of panic and potentially great peril. According to Elyse Gardner, it is "deeply troubling" that the last public tour of the Fallon facility is now scheduled to be on Saturday, February 13th. She is "especially concerned about the horses left overnight without water after their grueling roundup on January 31st. How are they faring?" No one knows for sure, and the BLM isn't talking.